The Royal Ocean Racing Club's UK domestic season fires up with the Easter Challenge, taking place on the Solent over the Bank Holiday weekend of 25-27 March. Coaching is an aspect of sailing typically reserved for its upper echelons: America's Cup and Volvo Ocean Race teams have coaches, as do Olympic sailors. But to help raise the standard of its racing, the Royal Ocean Racing Club lays on coaching for free to participants in the Easter Challenge. The RORC ropes in some of the world's best to carry out this tuition. The coaching team will once again be led by Jim Saltonstall, MBE. Too modest to admit it, Saltonstall has played a pivotal role in the success of most of Britain's leading Olympic sailors including Sir Ben Ainslie, Chris Draper, Iain Percy, Nick Rogers and the RORC's own Principle Race Officer, Stuart Childerley. Based out of Rhode Island, Allen was a two time college all-American champion and is one of North Sails' one design specialists, currently part of their Class Sails Development team. Josenhans is accomplished enough to get his own Wikipedia page: A two time Soling and one time Star World Champion (the latter with Buddy Melges), he was also crew on Bill Koch's America's Cup winner, America³, and subsequently on Young America. The team will be supplemented by other luminaries of North Sails UK. The coaching will form two parts. During, before and after racing, the team will be out on the water on RIBs and can provide one-on-one coaching to those looking for it (who must make themselves known to the RORC in advance). For the Easter Challenge, the rules governing 'outside assistance' are relaxed, so the coaches can not only advise on trim from off the boat, but, if asked, can come on board too. Similarly, during racing, trimmers can be taken on to a coach RIB to see how their boat's mast and sails set-up appear from afar. The coaches are able to provide useful advice for crews of any calibre from seasoned pros and to novices. 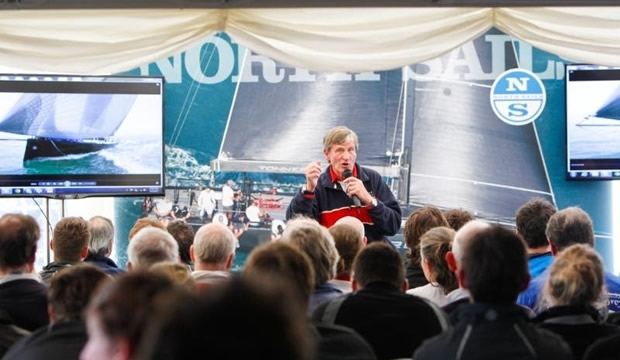 On the water, the coaching team takes video and afterwards Jim Saltonstall leads a valuable debriefing session, which, for the second year, will take place at the RORC Cowes clubhouse (ie not the Cowes Events Centre). Among those looking to make use of the coaching this year is the Royal Corps of Signals Yacht Club crew on board the Elan 333, Skywave. Bosun Al Smith, a Staff Sergeant in the Corps, competed in the Easter Challenge last year on board British Soldier, the Army's J/111 and explains: "I realised what a good environment it was for both racing and training. Because of all the feedback you get at the end of each day and the coaching on the water, we decided to enter this year. It is a kick-start for our season and we'll take whatever we can get in terms of advice." Having been absent from racing for a while, the Royal Corps of Signals Yacht Club is looking to reactivate its yacht racing and are starting a two year plan culminating in next year's Rolex Fastnet Race. "The filming, which we could watch back afterwards - it was nice to go up to the clubhouse and experience that," continues Smith. "Last year we had to rush up to the club as quickly as possible for the debrief feedback, because it was extremely popular - standing room only." Inshore racing at the Easter Challenge is scheduled to run from the Friday morning (25th March) until Easter Sunday early afternoon, allowing teams to get home for the evening, laden with the chocolate prizes they will have won.